Better in plenty of ways. These might not be the best active noise cancelling headphones out there, but if you want a bang for your buck pair of wireless ANC headphones these are a good buy. The last time we checked out a Plantronics product we weren’t sure how to feel about it. The Backbeat Pro+ were a decent pair of headphones but they weren’t the prettiest, they were hard to use, and they were also bulky. 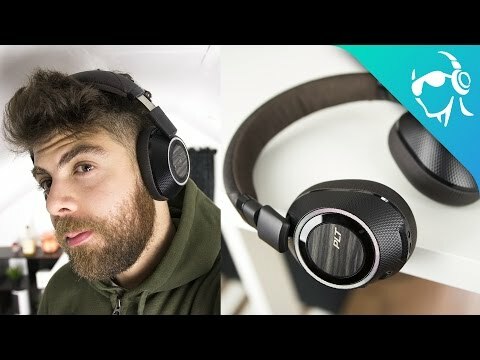 Now we get a chance to look at the new Backbeat Pro 2 headphones which seem to have fixed some of these issues, but is it enough? In the box you’ll get a nice carrying pouch with the headphones safely inside. then you’ll get a 3.5mm audio cable, micro USB charging cable, and the instruction booklet. When it comes to the build, the Backbeat Pro 2s feel solid and more refined than their previous versions. They’re still packed with features, but they’re slimmer than both the original Backbeat Pros and the Backbeat Pro +. That’s not to say that they’re still not bulky (because they are), but the bulk is way more manageable now. Much more similar to in size and feel to some of its competitors like the Sony H.ear on Wireless NCs. These are mostly made of plastic, but there is a nice pleather padding on the ear cups and headband. The bottom portion of the headband is even made of a breathable mesh to help with comfort. One of the defining features of the Backbeat Pro line of headphones is the amount of control the user has overt their music without needing to reach for a source device. That trend continues here with buttons, switches, and rotating wheels all over the place. On the right ear cup there’s a multifunction button on the side, micro USB and 3.5mm inputs on the bottom. Along the edges you’ll find another button and then a switch. We’ll go over the exact functionality of each one in the next section of the review. The left ear cup has a single switch along the edge, playback buttons on the side, and a rotating volume ring. As far as design goes these definitely grew on me. The plastic is entirely black but the ear cups have a textured pattern to them that’s a little weird at first, but you get used to it. The headphone padding is a dark brown that kind of gives the headphones a more professional-ish look. What does throw off the look slightly is the fake wood pattern on the outside of the ear cups. Though I grew to like it, at first glance it looks completely out of place and I can see how this kind of design wouldn’t be for everyone. One other aspect of the headphones that I wasn’t fond of is that they don’t have the ability to fold. The ear cups swivel 90 degrees so it’s easy to slide them back into the carrying pouch when you need to, but if you’re looking to save space in your bag while traveling or commuting you might have an issue with these. One of the most impressive aspects of the headphones has to be the connection. Using Class 1 Bluetooth, these are able to stream up to 100 feet. In our testing it was a little closer to 80, but that’s still more than enough. It has a similar range to the Beats Solo3 Wireless but lacks the part where it seamlessly connects to your devices. The Backbeat Pro 2 is still easy enough to connect to (and it does have NFC so you shouldn’t have a problem if you have a compatible device), but you’re going to have to go to Bluetooth settings and click to connect occasionally. As we mentioned before, the Backbeat Pro 2 still have a confusingly robust set of switches and buttons, but they give you complete control over basically everything. You can pause/play music, skip between tracks, or adjust volume using the controls on the left ear cup. That’s also where you’ll find the switch to turn on or off active noise cancelling as well as the “Open Mic” mode. This uses the microphones in the headphones to let sound in so you can hear what’s going on around you. It came in handy when the train I was on was experiencing delays. I could hear exactly what was being said by the conductor without ever taking my headphones off. You can also access any personal assistants or answer phone calls by pressing the button on the side of the right ear cup. If you take them off, sensors in the ear cup will know that you’re no longer listening to music and pause automatically. Plantronics claims a battery life of 24 hours of constant playback and that seems to be correct. I say “seems to be” because I’ve been using these on and off for about a week straight for hours at a time and still haven’t been able to get them to die. If you mainly listen at your desk or during commutes, you can easily make these last a week or two. Tapping the button on the right ear cup when you’re not wearing them will also illuminate tiny indicator lights so you know how much juice you have left. These are active noise cancelling headphones, but don’t expect to get much noise cancelling out of them. Where other headphones cut out low hums from trains pretty much entirely, the Backbeat Pro 2 more like cut it in half. It was significantly less obtrusive ot the listening experience, but it was still there. The Backbeat Pro 2s have a decently strong low end that makes songs enjoyable, but they are a little too big sounding in my opinion. Songs that have deep thumping bass kicks or rumbling bass lines tend to sound a bit muddy. That’s not to say that it sounds bad, but it definitely bleeds just a little too much into the lower mids. A good example of this is in “L.E.S” by Childish Gambino where the bass kick throughout the song is given too much prominence. Besides the occasional muddiness in the lower mids, vocals were nicely detailed. They sit just slightly above everything going on underneath them but it was enough to give them prominence. The dreamy vocals of “Let it Happen” by Tame Impala sounded great, even though some of the background elements were a little too forward. The highs found a nice balance between having a good enough amount of detail without becoming piercing. The airy reverb I look for in hi-hats and cymbals got cut down a little but even on max volume they were comfortable to listen to. Shown here hadging off Adam’s desk, the Plantronics Backbeat Pro have long been a favorite of ours. One of the most important aspects of buying something is the price, and I think I kind of like leaving this until the conclusion. If you want a Bluetooth pair of active noise cancelling headphones, you have a few options like the Bose QC35s or Sony H.ear on Wireless NC that immediately come to mind. But both are about $350. This is where the Plantronics Backbeat Pro 2 takes the cake, because they only cost $199. Of course the ANC is nowhere near as good, so if that’s the most important feature to you then you may want to spend a little more. But there are still a few really useful features these offer, even if they are a little confusing to use. They have a great battery life, decent sound, are fairly comfortable, and are almost half the cost of their competitors. If you want the best ANC headphones around, these aren’t them. But if you would never in a million years pay almost $400 after taxes for headphones, the Plantronics Backbeat Pro 2 might the bang for your buck deal you’ve been waiting for. Sound shapes your day, so enhance every moment with BackBeat PRO 2 wireless headphones. Ondemand active noise cancelling creates an oasis of personal space in a public place at the touch of a button.